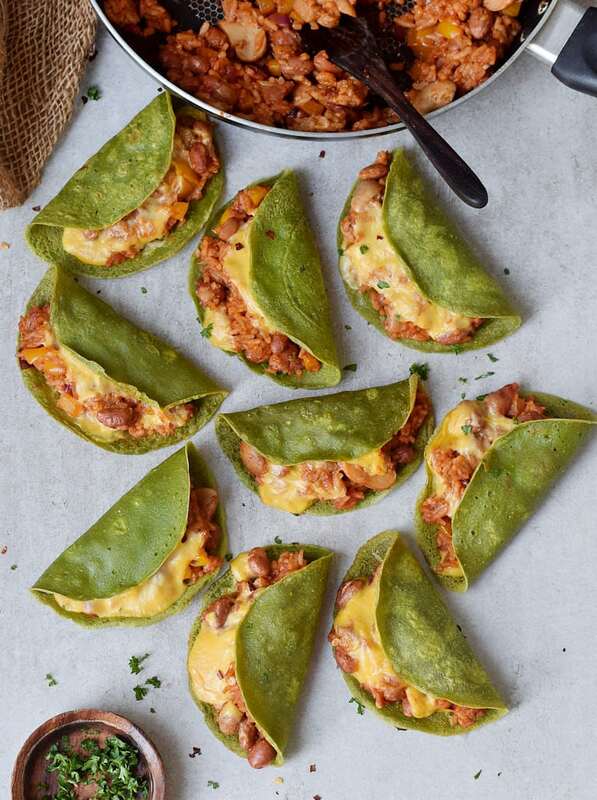 Crispy and hearty oven baked tacos with spinach! So satisfying and delicious! 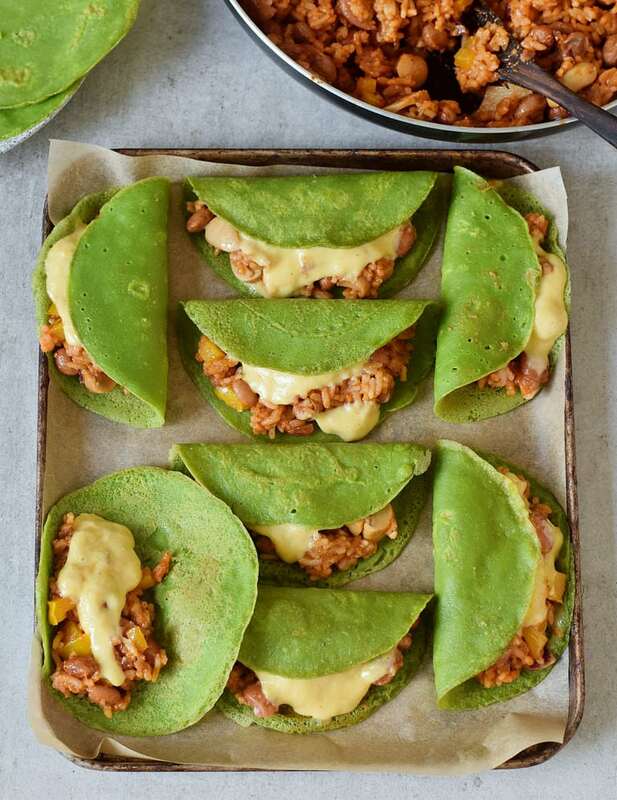 These tacos are oven baked (not deep fried) and therefore not only healthy but also vegan (meat-free, dairy-free), gluten-free, and easy to make. Are you excited about this delicious vegan dinner idea? 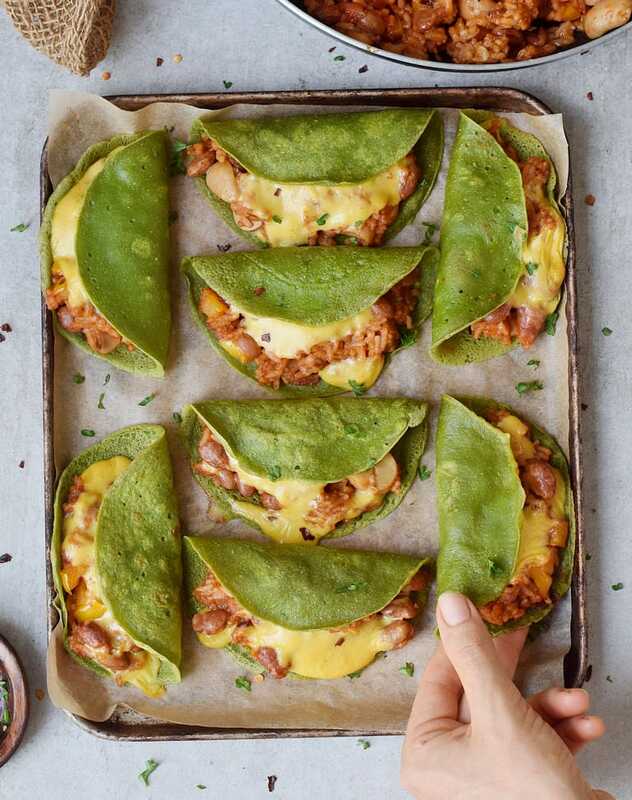 How pretty are these oven baked green tacos? I just love the natural green color which is so vibrant and rich! The secret? Spinach! 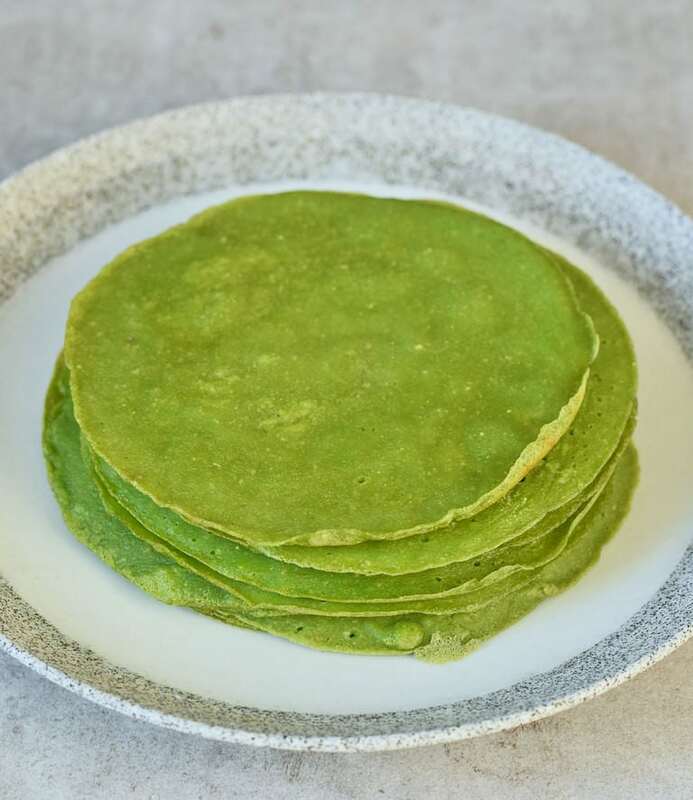 I made my favorite Spinach Tortillas which are seriously my go-to recipe for healthy tortillas! These spinach tortillas are much healthier than any tortillas from the store. Why? Not only are they gluten-free, but they are also grain-free, plant-based (dairy-free) and protein-rich. No wheat, no corn, just two different flours (chickpea flour and tapioca flour), water, spinach, and salt! That’s it! No artificial colors, no preservatives or other questionable ingredients. However, if you are too busy, stressed or not in the mood to make your own tortillas, don’t worry! You can, of course, also use store-bought tortillas (I sometimes do too but I prefer my homemade tortillas). Flour tortillas, corn tortillas, soft or hard shell tortillas are fine too! So, let’s talk about the filling. 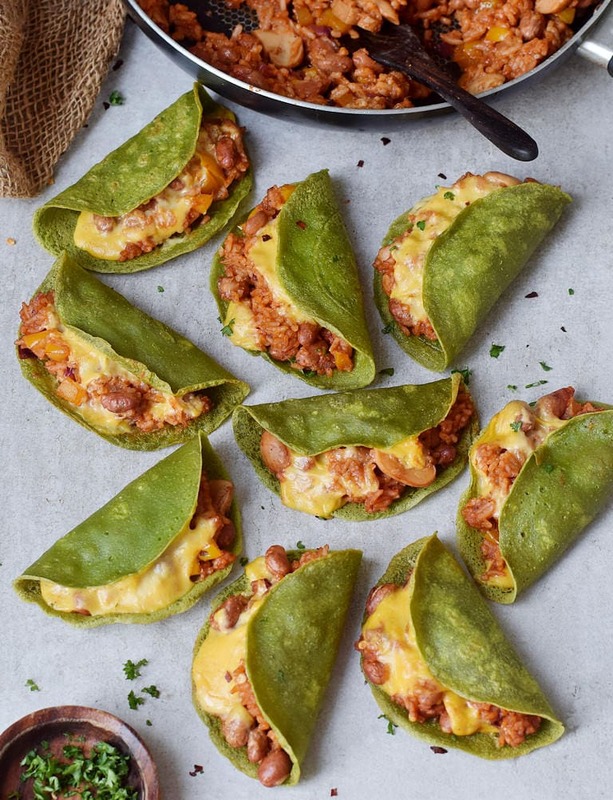 These oven baked tacos are stuffed with simple ingredients. 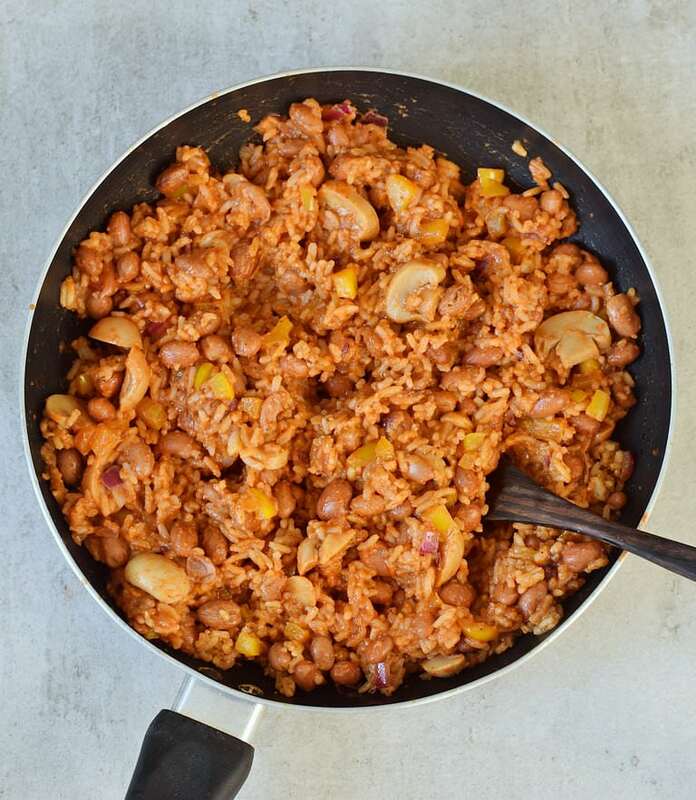 I wanted to keep it really easy and therefore only used kidney beans (you can use black beans or chickpeas instead), bell pepper (you can use red, orange, yellow or green pepper), mushrooms (canned or fresh are fine), onion, garlic, rice, and different condiments. And that’s it! If you want to keep this recipe grain-free, simply use quinoa instead of rice. If you don’t like pepper or mushrooms, just use different ingredients of choice. Some examples would be zucchini, eggplant, sweet potato, tomatoes, corn, etc. 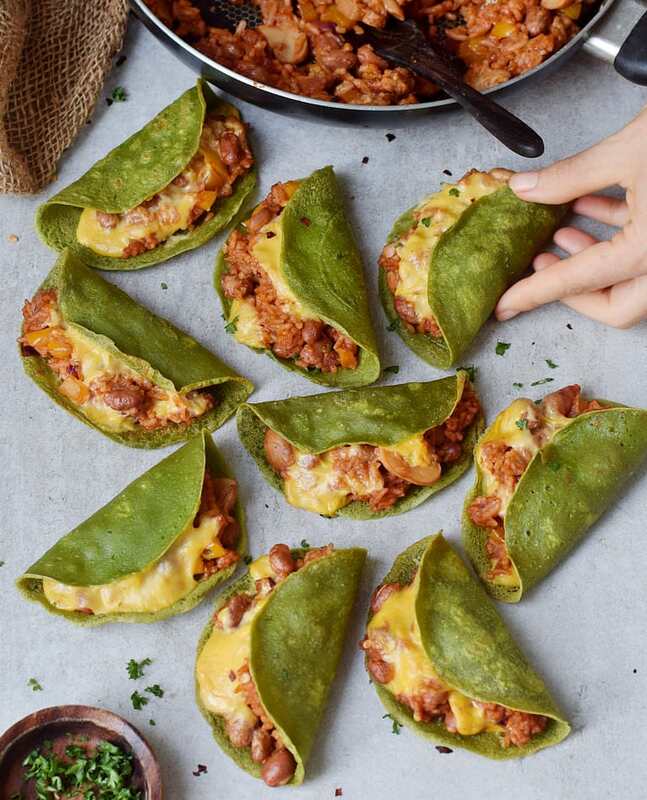 How To Make Oven Baked Tacos? It’s seriously super easy to make these vegan baked tacos. 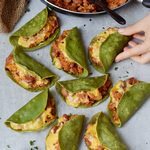 All you need is tortillas (either homemade, store-bought flour tortillas or corn tortillas, soft ones or tortillas with hard shells) and the savory filling. The filling is done in 10 minutes in a skillet. You just have to fry all ingredients in the pan and add about 2 tablespoons of the filling onto a tortilla. Top it with vegan cheese (either homemade or store-bought) and fold the other side of the tortilla over the filling (if you use soft tortillas). Check the pics above to see how easy it is! You can reheat leftovers of the filling in a pan/skillet the next day. The rice mixture keeps well in the refrigerator (covered) for up to 3-4 days or in the freezer for a couple of months. You can also store the tortillas (covered with a bag) in the fridge or even freeze them (in freezer bags). The tortillas will become a bit dry in the fridge. Simply put them individually into a hot skillet (20 seconds from each side) until they are warm and pliable again. 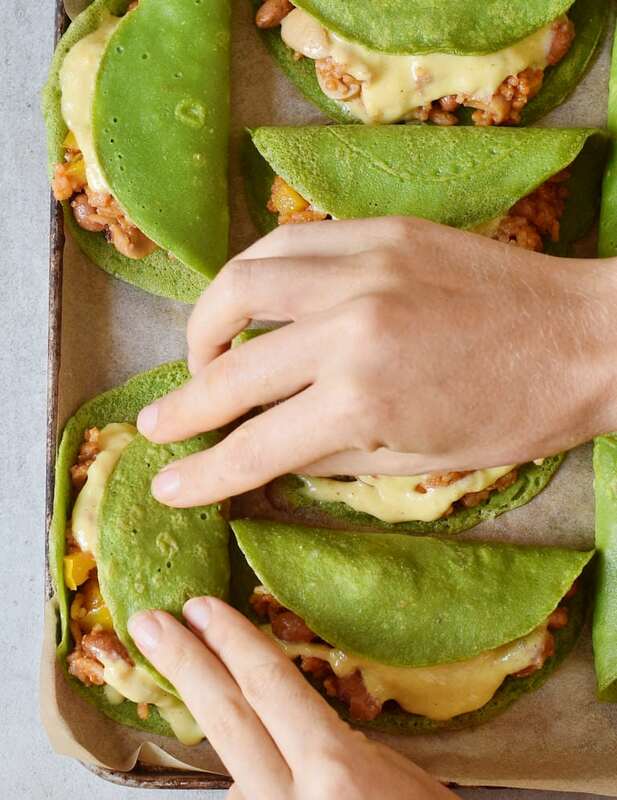 These oven baked spinach tacos are perfect for kids! Why? Kids normally don’t like to eat spinach (well at least I didn’t really like eating lots of spinach when I was little). 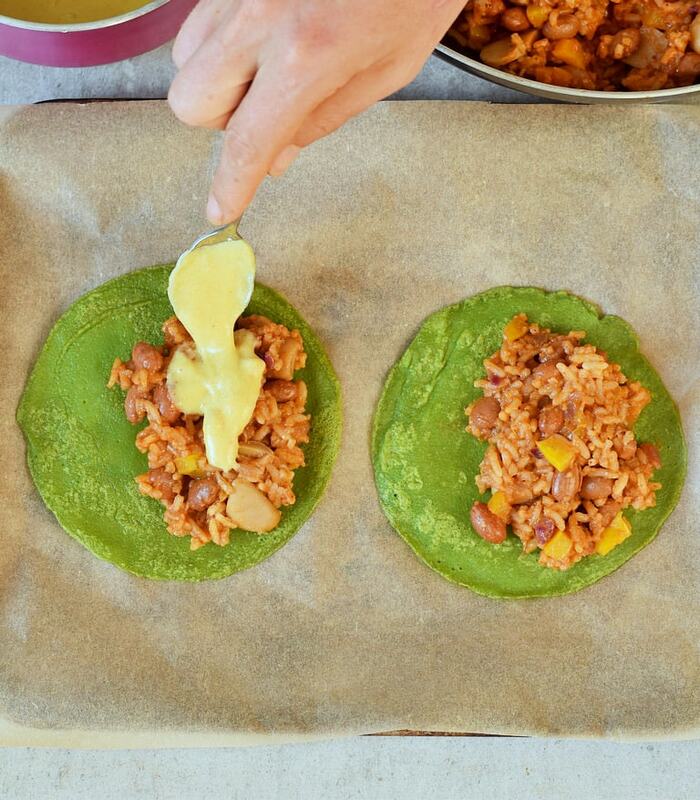 You can add lots of fresh spinach to these homemade tortillas and the great thing is that it’s pretty much tasteless! I am not kidding! I really love these spinach tortillas so much, to me they actually taste better than my regular homemade tortillas (without spinach)! You can serve these oven baked vegan tacos for dinner or as a side dish. I normally eat a huge rainbow salad for lunch but sometimes I am extra hungry and make these baked tacos in addition. You can make big ones or small ones (depending on the size of the tortillas). This time I made the tortillas pretty small in a 12.5 cm (5-inch) skillet and in my opinion they turned out super cute! Should you recreate these baked vegan tacos, please leave a comment below and don’t forget to tag me in your Instagram or Facebook post with @elavegan and #elavegan because I would love to see how your vegan baked tacos turned out! If you like crispy tacos, I am sure you will also love my Buffalo Chickpea Taquitos! 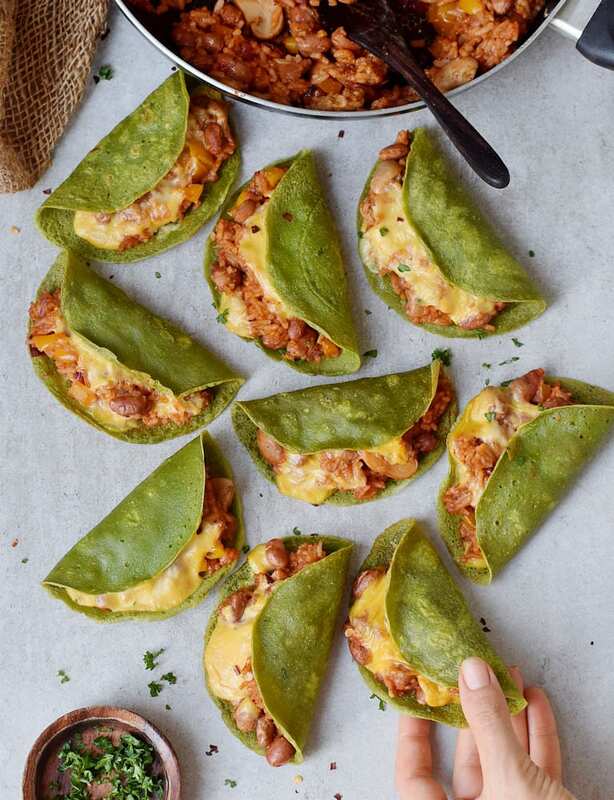 These oven baked tacos are made with spinach tortillas. They are healthy, vegan, gluten-free, and easy to make. Perfect as dinner, snack or side dish! Sauté for about 3-5 minutes, then add garlic for a further minute. Stir occasionally. Add all spices, balsamic vinegar, soy sauce, plant-based milk, passata, and hot sauce. Stir and let simmer for about 3 minutes. Add cooked rice and beans, stir and turn off the heat. Preheat oven to 410 degrees Fahrenheit (210 degrees Celsius) and line a baking sheet with parchment paper. Make one batch of the vegan cheese sauce (click) or use store-bought vegan cheese. Add about 2 tbsp of the rice filling on one side of a tortilla and 1 tbsp of the vegan cheese. Fold the other side over the filling and press it slightly down with your fingers (see pictures above in the blog post). Do the same for the remaining tortillas. Transfer all tortillas onto the baking sheet. Bake in the oven for about 10-15 minutes or until crispy. Enjoy hot! 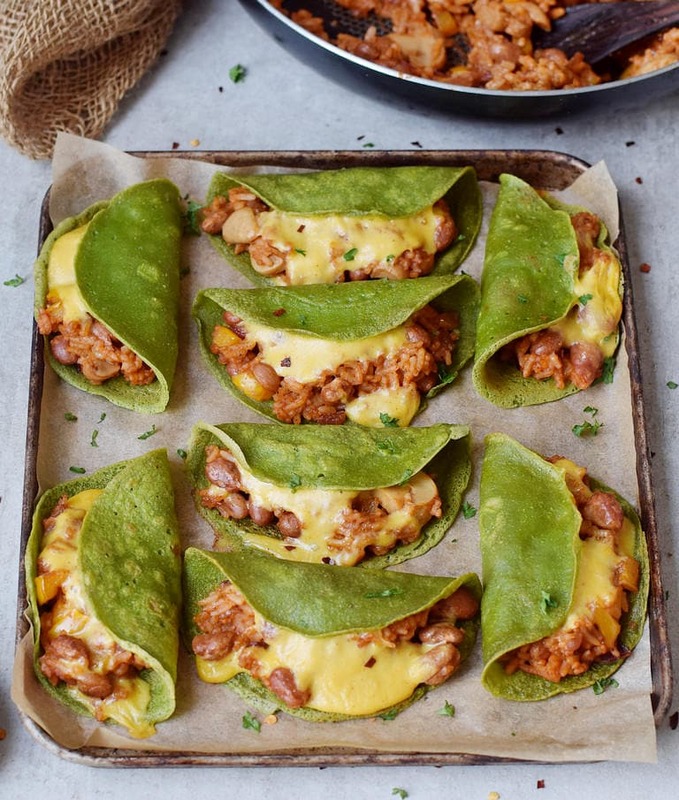 The baked tacos look mouth-watering! What flour to use for the tortillas? Sounds great! I already love the normal tortillas, which I turn into burritos, so that is going to be perfect! If I have no issues with gluten does it work to use regular flour in place of both flours in the tortilla recipe? Hi – I made this entire recipe last night. Overall it was a huge success. Our family is moving to a plant based diet and looking at trying new things. The taco filling was delicious and the cheese sauce was great. I had a harder time with the tortillas. They came out thick and spongy. I made two batches and used more water with the second batch but they were still too thick. I think if they had been thinner it would have been perfect. They definitely were not crispy. I live in Denver which is high altitude. Wondering if that might make a difference? Still a hit with the family and will be repeating, but need to work on the tortillas. Any tips or suggestions would be great! Just a question: I used brewer’s yeast instead of nutritional yeast because it was what I had at home. Do you know brewer’s yeast? Do you think the flavour is much different than nutritional yeast? I enjoyed it anyway, but I never tried nutritional yeast and I was thinking if the sauce could turn out better.